Waterloo Uncovered is open to all current and former service personnel (reservist or regular). We welcome applications from all ranks, units or trades, and do not discriminate on the grounds of age, gender, sexuality, ethnicity, disability, experience, or motivation — if you are interested then we would like to hear from you. Whilst a key focus of the charity is assistance to those who are wounded, injured, or sick (whatever the cause and whether or not it happened in service), we do not exclude those who are fully fit. If you need the assistance of a carer to join the project, then we can also accommodate them — please let us know in your application. The next excavation will take place in Belgium, 6 to 20 July 2019. The application process is in two stages: an application form and a Skype interview. Those successful at the application form stage will be invited to participate in a Skype interview in March. The 2019 application process is now live. The deadline for applications is midnight on Thursday 28th February. Please download and fill in the appropriate form (see options above). Completed forms should be submitted to apply@waterloouncovered.com no later than midnight on Thursday 28th February. 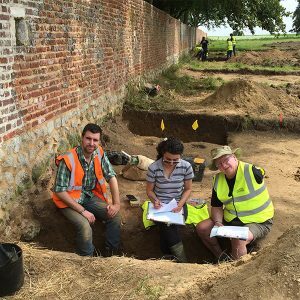 We accept volunteer applications all year round, as they are not restricted to volunteering on our excavations. If you would like to volunteer with us, please download and fill in the Volunteer Application Form below. The completed form should be sent to volunteer@waterloouncovered.com. an application form for either veterans, serving personnel, or volunteers (see above). Please send all completed forms to: apply@waterloouncovered.com. Waterloo Uncovered is an international charity, and we accept applicants from any country. We are in the process of translating our application forms. If you need any forms or information in a language other than English, please do not hesitate to contact us in your language, members of the project speak a variety of languages and we will find a way to translate.